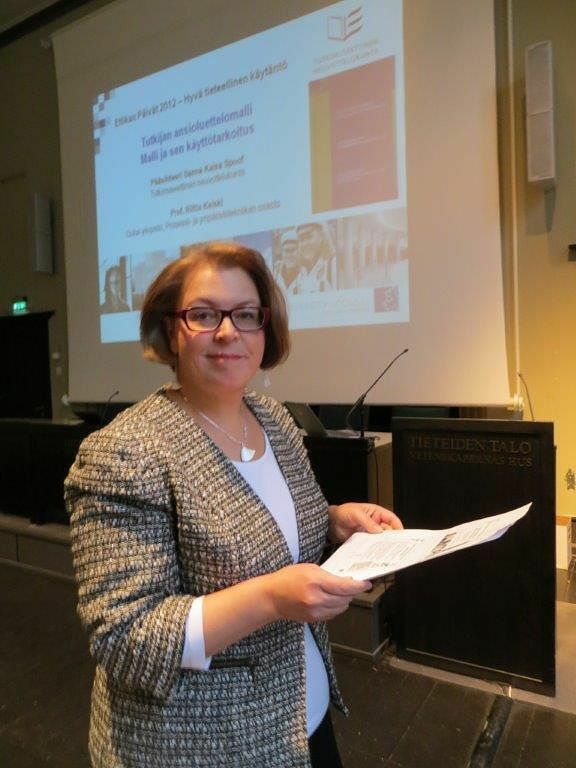 As Secretary General of the Finnish Advisory Board on Research Integrity, Dr Sanna Kaisa Spoof has a ring-side seat on developments in research ethics in Finnish research circles. Today the major source of disputes is disagreement over authorship. In the RCR guidelines, research teams are recommended to agree on authorship issues in advance, before writing down a single line, but this is still far from the norm. Problems arise if some member of the research team feels their name should have been on the report, or somebody else's name shouldn't be there. Even the order of the names matters: in some fields the first name listed is the most important, in some fields the last. The number of authorship issues varies by discipline. For example, in the humanities the authors of a paper or a monograph can usually be counted on one hand, and frequently the contribution of each author is clearly delineated; in contrast, a research team in physics may have several hundred members, which makes it far more challenging to list each individual contribution in the publication. According to Dr Spoof, issues and disputes over authorship often spring from rivalry between researchers. Since the status of a researcher is often determined by the number of their publications and how prestigious the journals are where they are published, many researchers are eager to have their name on as many publications as possible. Universities collect this data into citation index databases, which are frequently employed to rank universities. Thus, citation numbers improve the standing not only of the researcher but their employer as well. Dr Spoof notes that there have even been occasional allegations of researchers padding their list of publications to enhance their citation index or to improve their chances with job or research grant applications.